On view through April 7, 2019 at Plaxall Gallery, Inside/Outside documents the struggle that artists enduring mental illness experience every day. From displaying a fragmented sense of self to simplifying the figure down to a minimalist aesthetic, many works on view in the exhibit pay homage to the mind’s sense of self and the existing relationship between the mind and the body. Including artists such as Corran Shrimpton, Ella Veres, Nandan He, Angela Roger and many more, the works on view draw from the rich tapestry present in both the nearby Fountain House gallery community of artists and the Flushing Interfaith Council to produce an intersectional and urgent conversation around the effects of mental health on the artist community in NYC and beyond. Inside/Outside at Plaxall Gallery, featuring work by Corran Shrimpton. Image courtesy the gallery. On Thursday, April 4th, Fountain House Gallery in partnership with Plaxall Gallery will present a panel discussion around topics related to mental illness that are present in the exhibition. The Panel takes place from 5:30-7 pm at the Gallery space, is free and open to the public, and will feature artists Evan Brown, Wilfredo Benitez, Gina Minielli, Sharon Taylor and Maura Terese in conversation with curator Nancy Bruno and Ariel Willmott, Director at Fountain House Gallery. Fountain House Gallery Director Ariel Willmott notes the importance of featuring artwork in conversation around mental illness as crucial both to the wider community and for her personally. “The urgency and need for breaking the stigma around mental illness has become very clear to me and I believe that artists through their art and voice play an important role in achieving this,” she reveals. 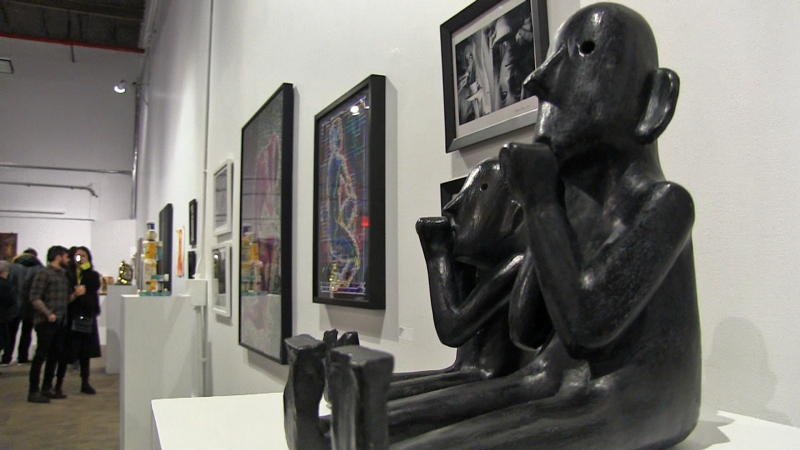 Visions of self and a sense of longing and alienation permeate works throughout the gallery space. 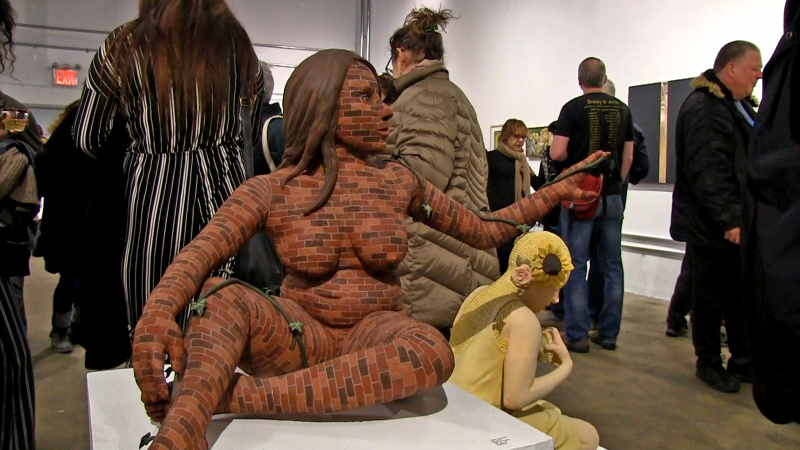 Shrimpton’s iconic sculpture depicts a female figure seemingly comprised of bricks that evokes a sense of constructed identity: while some of possess a firm understanding of who we are, those burdened with mental illness can shift in their relationship to self every single day. A self-understanding seemingly constructed from sturdy bricks one day can feel unstable and flimsy the next, depending on one’s mental health state. Many of the paintings, sculptures and mixed media works on view reflect on partial, obscured and/or alternate views of one’s self. Identity becomes shrouded in a filter according to one’s daily physical and mental chemistry, according to prescriptions taken and not taken, mood or hormonal shifts. Many of the works on view are created by women, echoing societal pressures prevalent on how women and their figures are viewed in a highly critical society as opposed to the lack of critical attention paid to their male counterparts. It is important to remember, however, that mental health issues can affect everyone regardless of race, gender, religion, socioeconomic status or age. Artworks on view grapple with a wide range of topics, which are treated with a delicate, insightful nuance. Visitors are encouraged to aspire to a sense of empathy around mental illness. Perusing artworks on view in the space, guests can better gain perspectives around the challenges these artists confront every day in creating artwork, interacting with others, and searching their own sense of self. Introspection and admiration are encouraged at this profound, moving exhibition that deconstructs the building blocks of identity through a stunning array of artistic practices. Inside/Outside is on view at Plaxall Gallery through April 7th, 2019. The gallery is located at 5-24 46th Avenue in Long Island City, Queens, and visiting hours are Thursday, 6-10 pm & Saturdays/Sundays, 12-5 pm. Don’t miss your last chance to witness this compelling contemporary view into the minds of artists working around mental health topics.